According to Alphaliner the global containerfleet has breached the 18 Million teu mark (normal capacity in teu) at the end of 2014. The 2014 end figures for the global box fleet are estimated. All reports sofar say that the boxfleet has grown in 2014 slightly less than the 1.6 Million teu in 2013). 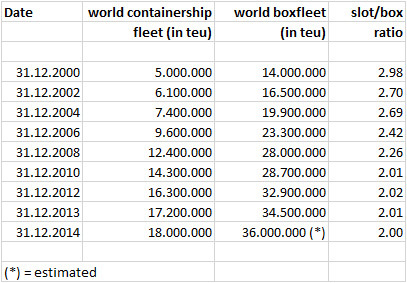 From the below table one can see that the slot/box ratio has remained pretty stable at 2 teu per each available shipslot which shows that the container shipping lines have meantime reached a level of efficiency in their boxfleet management which is hard to improve any further.